Everyone in communications should light a candle today for what may be the most revolutionary invention so far in the 21st Century. 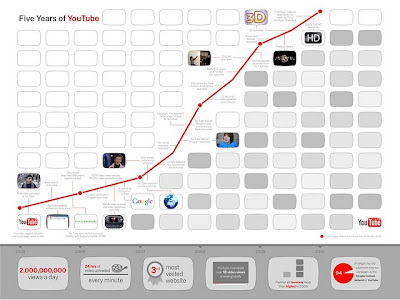 YouTube turns 5. It launched in May 2005. In four and a half years, it was attracting a billion hits a day. Hitting the 2-billion mark required only another six months. And the revolution has only begun. From amateur home videos and “vloggers,” YouTube now offers feature films, live sporting events and an opportunity for individuals around the world to “broadcast” their own videos – including scenes of repression and violence in countries that try to censor all communications. It attracts nearly twice as many viewers as the three major TV networks combined, in prime time. YouTube says that viewers spend an average of 15 minutes a day watching its videos. But the company is determined to increase that amount of time significantly – and, as the New York Times points out, to move YouTube from the computer to the TV screen. We encourage our clients to take YouTube seriously as a powerful communications channel. Many companies have felt the sting of barbed attacks on uploaded videos. And many others have tried to take advantage of the opportunity to get their own video messages to the public, with mixed results. The challenge is to keep our own understanding and effective use of YouTube expanding as fast as the channel itself is evolving. Worth some thought, even as we say Happy Birthday. Could Vogtle be Nuclear Energy's Florence?